Cannes: Monday & Callas selling, Unlocked still filming? Frederik May 12, 2016 Comment? Lots of film news today, check out the following update as well. First, some news from Cannes. The 2016 film festival gets underway today with a swarm of jet-lagged but hungry buyers, and plenty of product for them to evaluate, in every genre. Among them is the anticipated “What Happened to Monday?” which will be looking for a buyer for its theatrical distribution. Fingers crossed it’ll be picked up and released soon. Funnily, “Callas” is also selling at Cannes. If you remember, last year the project was announced at the festival with Noomi in the lead role to portray the famous opera singer. Unfortunately, it’s been the first and also last news on the project so far. So, at least it’s back at Cannes again :-) In other news, the Evening Standard has interviewed John Malkovich, who’s part of the killer-cast of “Unlocked”, which stars Noomi, Toni Collette and Michael Douglas. According to the article, the film is all but finished except that Malkovich has been asked to shoot some extra scenes, rather to his annoyance given his frantic schedule. This comes as a surprise since Noomi has filmed her scenes beginning in November 2014! With no release date in sight, this might take up to three years after its inital begin to finally see the light of day. Frederik May 18, 2015 Comment? Apparantely, there is a reason for Noomi’s apparance at the Cannes Film Festival. After last week’s announcement of her starring role in “Callas”, a photocall has been held for the film at the festival, yesterday. Pictures have been added to the photo gallery. Edit: Over 200 pictures from the premiere and the photocall have been added. Many thanks to Lindsey for her wonderful contribution. Frederik May 13, 2015 Comment? 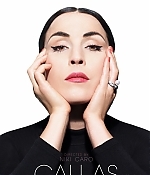 Here comes a major scoop for Noomi Rapace, according to Entertainment Weekly: Rapace has signed on to play one of the most famous opera singers of all time: Maria Callas. Niki Caro (McFarland, USA) will direct Callas and has adapted the screenplay from Alfonso Signorini’s biography, Too Proud, Too Fragile. Content Media is introducing the film to distributors at Cannes. Callas is considered to be one of the most influential female opera singers of the 20th century, and the biopic will focus on her passionate relationship with Aristotle Onassis, a romance that spanned almost two decades. “We fell in love with Callas instantly,” Content’s president of film, Jamie Carmichael, said. “It’s such an emotional and powerful story of one of the world’s great romances—and we’re certain that audiences around the world will be charmed and entranced by the passion, beauty, and operatic splendor of this epic tale.” Content has also released the first image of Rapace as Callas.